manages buffet or refreshment canteen; supervises staff, supply of provisions and sale of refreshments. as for coffee house keeper (q.v. ), but usually catering for better class of customer. keeps stores, orders provisions, arranges menus, responsible for cooking and distribution of food in canteen, also for cleanliness; keeps books, supervises staff; in large canteen duties are purely supervisory; in smaller canteens, performs few or many of the tasks himself, including cooking, according to number of staff employed. (ii) owns or manages business carried on for purpose of providing meals for public; buys, prepares, cooks and serves food and drink either on own premises, i.e., in hotel, restaurant, cafe, or for special occasions, e.g., balls, garden parties, on premises provided by clients; actual duties vary greatly according to size of business from purely proprietary interest to actual execution of practically all tasks. sells chip potatoes and generally fried fish also, for consumption on and off premises; usually performs actual cooking in oil coppers. provides, cooks and serves food to members on club premises; tends bar, cleans premises, sometimes arranges reading room; makes beds and tidies bedrooms if club is residential; duties vary from manual to supervisory according to size of club and number of staff employed. is manager or proprietor of coffee house, where usually only light refreshments are sold. prepares and sells coffee, tea and light refreshments at a stall or refreshment stand, of fixed or movable character; cleans stall, washes dishes; usually owns stall, but sometimes holds it on tenancy. proprietor or manager of establishment which provides meals of a cheaper variety. sells stewed eels and eel pies, generally in conjunction with the sale of tripe or fried fish; usually does actual cooking; proprietor or manager. prepares, fries and sells fish and chip potatoes; frequently also cooks and sells tripe, trotters, cowheels, peas, etc. 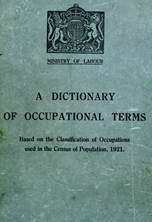 owns or manages establishment in which luncheons and light refreshments are provided mainly for consumption on the premises; purchases provisions, cooks and serves from counter of bar; actual duties vary with size of business and number of staff employed; in small establishments, may do all work himself; in large establishment is usually supervisor only. undertakes to supply provisions or meals on a large scale at a fixed price, for messes of various kinds. orders provisions from headquarters, e.g., Navy, Army and Air Force Institute; keeps stock, checks prices; supervises staff of cooks and waiters, preparing and serving meals for army officers and N.C.O. 's; sometimes serves wines; usually an officer in civil government employ; duties mainly supervisory and clerical. sells oysters, mainly for consumption on the premises, where oysters only are sold and no cooking is done. sells cooked peas or pease pudding, with or without other food, e.g., tripe, fish, etc., for consumption on or off premises. owns a pleasure garden in which are usually sold tea and light refreshments; sometimes also provides amusements, for which a charge for admission is made. undertakes to supply refreshments, usually on a large scale, at a certain price or rate; staffs and runs refreshment rooms on railway stations, in place of amusement, etc. owns or manages establishment, where are sold tea, coffee and light refreshments for consumption on or off the premises, which may be licensed or unlicensed. owns or manages restaurant where refreshments or meals may be procured by the public, usually for consumption on the premises; for duties see caterer. cooks and provides suppers of a cheap variety. as for buffet manager (q.v. ), but holds no licence for sale of alcoholic liquor. sells tripe, usually obtained ready cooked from the tripe dresser; may re-cook tripe and serve hot with onions, etc., for consumption on or off the premises.